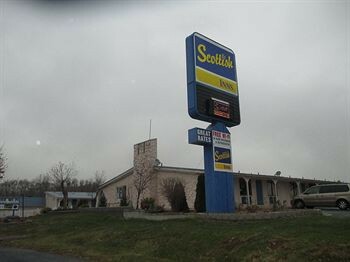 Property Location With a stay at Scottish Inns New Cumberland, you&apos;ll be centrally located in New Cumberland, convenient to West Shore Farmers Market and Monkey Joe&apos;s. This motel is within close proximity of Capital City Mall and City Island.Rooms Make yourself at home in one of the 117 air-conditioned rooms featuring refrigerators and microwaves. Complimentary wired and wireless Internet access is available. Bathrooms have shower/tub combinations and hair dryers. Conveniences include phones with free local calls, and you can also request cribs/infant beds.Rec, Spa, Premium Amenities Be sure to enjoy recreational amenities including a fitness center and a seasonal outdoor pool.Business, Other Amenities Featured amenities include complimentary high-speed (wired) Internet access, a business center, and coffee/tea in the lobby.